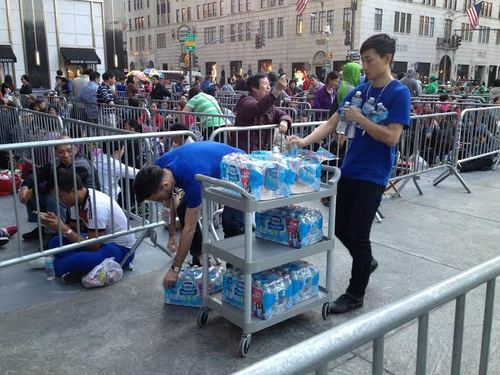 As usual, the debut of the new iPhone 6 from Apple has taken NYC by storm. In the lead up to the phone going on sale on September 19th, things were crowded as usual but relatively calm. But by the morning of the 19th the Apple store on 5th Avenue was a total mob scene. The Apple staff had pretty much lost control of any sense of order. In fact, people couldn’t even figure out where the line ended, and that was because it didn’t. The line for the new iPhone ran from the Apple store entrance between 58th & 59th Streets all the way up to 77th Street, almost a full mile away. The debut actually shut down all other business at the 5th Avenue Apple store. If your Mac Pro happened to fail you on the 19th, you were simply out of luck. For those Apple warriors who chose to wait in the hours long line, it was daunting for sure but not totally unbearable. Apple employees handed out free water (gotta stay hydrated! ), and Magnolia cupcakes kept people nourished. Seamless even delivered to the line. And when you walked out of the glass cube with your new iPhone 6, a holding pen of press were waiting to interview you about your new purchase. Local celebrities were made! 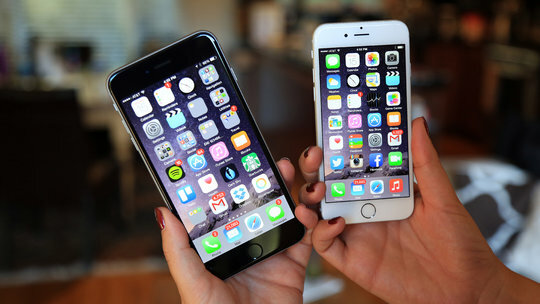 All in all, the New York Times reported that iPhone 6 sales topped 10 Million in it’s first weekend. And for the rest of us, we’ll simply pre-order and pick up our phones in the suburbs of NJ, CT and Westchester County at some point in the next few weeks when all the fuss has died down. This entry was posted on Monday, September 22nd, 2014 at 9:23 am and is filed under Accessories, New York City Events, Other Musings.... You can follow any responses to this entry through the RSS 2.0 feed. Both comments and pings are currently closed.